Beginning next week, on October 1, about 1,700 Massachusetts businesses that produce substantial food waste must sort and divert that waste to composting or another destination other than landfill. The new program is one of the most ambitious in the country. As of Oct. 1, Massachusetts has banned any establishment that creates a ton or more of food waste per week from sending as much as a carrot peel to the state’s rapidly dwindling available landfills. Despite a recycling rate topping 40 percent, Massachusetts businesses and households still toss about 6.5 million tons of garbage every year — enough to fill up Fenway Park 74 times. Most of it is piled into a couple dozen landfills where it slowly decomposes, the organic stuff from kitchens and yards spewing the greenhouse gas methane into the atmosphere, or hauled to a handful of waste-to-energy incinerators where it is burned to create electricity. So-called compostable organics make up more than 25 percent of the state’s commercial and household waste, and the goal of the new regulation is to divert much of that away from landfills. Where will it go? To composting facilities and energy plants that run on biogas (made primarily of methane) — places where it can actually be put to use. Clare Leschin-Hoar covered the Massachusetts news for the Guardian this week. Elsewhere in the country, Seattle is pursuing a similar policy just this week -- but without limiting it just to large waste producers as the Massachusetts policy does. For further background, the Natural Resources Defense Council (NRDC) has a longer 2012 report with estimates on the scale of food waste going to landfills. Most of these links were brought to my attention this week by Jennifer Otten, a faculty member in health services at the University of Washington. 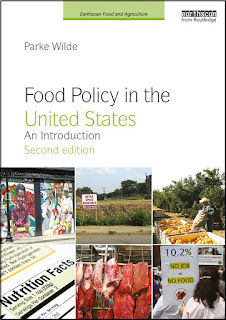 Professor Otten's food policy class uses my textbook, Food Policy in the United States: An Introduction. She reports that food waste issues make a great concrete local issue for use in food policy teaching: "Students get really into this topic, because it’s something they can do something about." USDA's Food and Nutrition Service yesterday released final results showing that the Healthy Incentives Pilot (HIP) had a significant positive impact on fruit and vegetable intake for low-income participants in the Supplemental Nutrition Assistance Program (SNAP). In the pilot, which was conducted in Hampden County, Massachusetts, HIP participants received a 30% incentive added back to their benefit card when they purchased targeted fruits and vegetables in participating retailers. A randomly assigned control group received SNAP benefits as usual with no incentive. 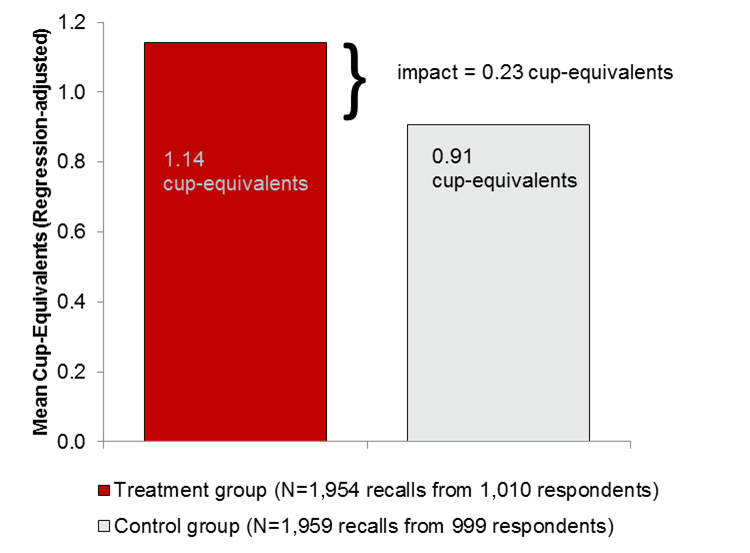 On average HIP participant adults on SNAP consumed 0.23 cup-equivalents more in daily targeted fruits and vegetables -- a 25% increase -- compared to the non-HIP adults on SNAP. The HIP Evaluation Study was led by Abt Associates, Inc., with participation from Westat and the Friedman School of Nutrition Science and Policy at Tufts University. Susan Bartlett from Abt was the project director. On behalf of the Friedman School, I was director of design for the evaluation study and a co-author of the final report. The pilot represents the most ambitious effort so far to deliver a healthy eating incentive to SNAP participants right through the SNAP card (as opposed to a separate coupon) and in a full range of participating retailers (as opposed to farmers' markets alone). The results complement new work being done by Wholesome Wave and others to explore the potential of financial incentives. The primary results were based on two post-implementation rounds of surveys of SNAP participants. Preliminary results, based just on the first post-implementation survey round, were published recently in the American Journal of Agricultural Economics (may be gated). The new full report released today has more information about a wide variety of food spending, shopping behavior, and food intake outcomes, and it analyzes the likely cost of extending such a healthy incentives program nationwide. An independent evaluation reported today that the Healthy Weight Commitment Foundation succeeded in removing more than a trillion calories from the U.S. food supply, as originally pledged. Through this pledge, leading food and beverage manufacturers had promised to reduce total food energy sold by 1 trillion calories, from a 2007 baseline through 2012. Using Nielsen scanner data from supermarket electronic cash registers and from a random sample of consumer households, Shu Wen Ng, Meghan M. Slining, and Barry M. Popkin estimated calorie trends and reported the results today in the American Journal of Preventive Medicine. To some extent, the accomplishment simply reflects downward trends in the packaged food and beverage sector, which is losing market share over time -- mostly to the restaurant industry but perhaps partly to healthier food options. In an accompanying editorial in the same journal, Dariush Mozaffarian asks whether the pledge is a "marketing ploy." As a rule, nutritional targets -- and other quantitative information intended for general audiences -- should be stated in easily explained per-capita terms. Who knows what a trillion calories in aggregate even means? It reminds me of silly infographics that take a common-sense concept and convert it to some obscure immense quantity. For example, in my in-box this month, I have an infographic from Guiding Stars, which aims to report the amount of running required to burn off the average American's sugar consumption. Sugar is estimated at 3 pounds per week (a sensible way of explaining the quantity), while the amount of running is stated as 2.7 times around the globe over a lifetime (an irrelevant quantity designed merely to appear large to easily-impressed readers). Today's study by Ng, Slining, and Popkin nicely goes beyond its assessment of the original trillion calorie pledge and also reports the modest but non-negligible resulting calorie changes on a per-capita basis. To the extent that the results reflect improvements in particular categories, such as sugar sweetened beverages, the findings are still reasonably upbeat. The Healthy Weight Commitment Foundation -- and the companies that made pledges -- will be delighted by today's coverage in major media outlets such as U.S. News and World Report, which states the good news broadly: "Obesity continues to plague the country, but it appears as though food companies are beginning to take strides in helping alleviate the problem." In my school's latest Wednesday seminar, the epidemiologist and cardiologist Dariush Mozaffarian methodically builds the scientific case for amending our traditional obsession with total fat (as a culprit in obesity) and saturated fat (as a culprit in heart disease). Then, from about minute 47:30 to 50:30 in the video, he drops the hammer. Summarizing this large body of research, he argues that federal dietary guidance to address chronic disease should focus on food patterns rather than nutrients. In sharp criticism of the "Go, Slow, Whoa" guidance that still appears on the website of the National Heart, Lung, and Blood Institute, Mozaffarian concludes, "This is insane!." The speech implies big changes afoot. And I don't just mean for federal dietary guidance. This summer, Mozaffarian took the helm as the fourth dean of my school, the Friedman School of Nutrition Science and Policy at Tufts University. Dean Dariush Mozaffarian, MD DrPH-Global Dietary Priorities and Policies to Improve Cardiometabolic Health from Tufts Friedman School on Vimeo. 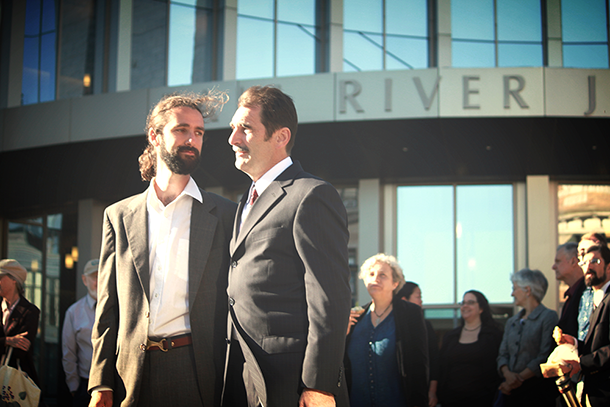 In an astonishing turn of events this week, prosecutors dropped criminal charges against two climate change activists who in 2013 used their boat -- the Henry David T. -- to block a large coal shipment to New England. Instead of proceeding to trial on September 8, Bristol District Attorney C. Samuel Sutter announced that he agreed with the activists that addressing climate change is a critical public concern. Taking the microphones afterwards, the prosecutor said he now planned to attend the People's Climate March in New York City next week, September 21. What persuaded Mr. Sutter? What makes a person in authority decide to support strong action to address an environmental challenge? I met one of the activists, Jay O'Hara, last year at a local meeting of church environmentalists. O'Hara is a Quaker, who speaks with calm conviction and common sense about the logic of his direct action. As you can hear in this morning's terrific Living On Earth interview, he is polite and respectful to people in authority, including police, even while quietly explaining the seemingly illegal action he has just taken. If it were not for the prosecutor's change of heart, the activists would have mounted a "necessity defense," saying their action was needed to prevent a greater public harm (as when somebody jaywalks in order to help an injured person out of a roadway). Reflecting on this week's events, which still amaze me days later, I see two key ingredients: (a) direct action, not just talk, without waiting for permission and (b) speaking calmly and reasonably, always believing that your opponents are capable of thinking clearly and being persuaded. For years, my family has been focusing on personal lifestyle changes to reduce our environmental impact. One of our key goals is to practice ways of living richly, while using fewer resources. Inspired by the news this week, my wife and I (and perhaps one or both kids) are now arranging our complex schedules for next weekend so that we, too, may be able to attend the People's Climate March in New York City, September 21. Will the beef checkoff ever be reformed? USDA Secretary Tom Vilsack said this week that he shares farmers' frustrations and will use his authority to make necessary changes to the beef checkoff program, according to a report in Beef this week. The program, known formally as the Cattlemen's Beef Board (CBB), uses the federal government's powers of taxation to collect a mandatory assessment (a tax, essentially) from beef producers. The program is overseen by USDA's Agricultural Marketing Service (AMS). Most of the money is funneled to the National Cattlemen's Beef Association (NCBA). A referendum on the continuation of the beef checkoff must occur every five years, and NFU’s board recommended that USDA “consider rewriting the beef checkoff program” under the generic Commodity, Promotion, Research and Information Act of 1996. I think USDA should adopt NFU's recommendations as soon as possible, seeking Congressional authorization if needed. It is ridiculous that such mild and obvious recommendations are even controversial. The Natural Resources Defense Council (NRDC) yesterday shared inspection documents for Foster Farms, the company at the center of a recent Salmonella outbreak that now appears contained. Today NRDC posted hundreds of noncompliance reports written by USDA food safety inspectors at Foster Farms plants around the country between September 2013 and March of this year. Most of the violations found were incredibly unsavory and include more than 200 from two California plants linked by the Centers for Disease Control and Prevention (CDC) to an antibiotic resistant Salmonella outbreak. Although the outbreak now appears to be over, the pattern of violations at Foster Farms plants doesn’t leave us feeling warm and fuzzy about the company’s commitment to protecting public health. And we still have not received any response to our questions about antibiotic use at Foster Farms. Food safety problems are fundamentally about lack of public information. If consumers had magic sunglasses that displayed the presence of Salmonella on chicken in the grocery store, there would be no need for government regulation. Immediately, faced with market consequences for distributing chicken with Salmonella, the companies would clean up their product. The Foster Farms case shows how much better off we would be if the public had access to more of the information that appears routinely in inspection reports. Ironically, even companies might benefit from market incentives to reduce problems at the inspection stage rather than waiting for an outbreak (which can cause many more millions of dollars in loss of sales and reputation). Thanks, NRDC, for helping to make such information available. The AGree agricultural policy initiative today released five point-of-view papers related to productivity, profitability, and environmental outcomes. The papers represent the diverse views of the authors, but one general theme is to encourage decentralized decision-making through which farmers and ranchers can address key environmental constraints, such as stewarding limited water quantity and protecting water quality. For example, Kristin Weeks Duncanson, Jim Moseley, and Fred Yoder (.pdf) propose using local boards "to cooperatively establish and advance long-term productivity and conservation goals for their watersheds through engagement and support of producers and landowners and guided by sound science." At their best, decentralized responses to environmental problems can have major advantages. Elinor Ostrom won a Nobel prize in economics for analyzing the ways that community-based decisions can in some cases address problems of the commons. At their weakest, decentralized responses may be insufficiently bold and comprehensive. Because the emphasis on decentralized approaches may not be matched yet with broader regulatory or tax-based responses to problems such as pollution, or property rights reforms to address water quantity, environmentalist readers of the five new papers may ask whether AGree fully acknowledges the determined national-level response that leading environmental challenges may require. I will be interested to hear which aspects of these five papers environmentalist readers find most daring, and which ones seem likely just to forestall or delay more vigorous initiatives. In the paper by Duncanson, Mosely, and Yoder, I didn't yet get a strong sense of whether the local committees' work would add up in the end to quantifiable aggregate improvements, such as reduced total nutrient flow to the Gulf of Mexico, Lake Erie, and the Chesapeake. Perhaps one thing that could be added to their admirable decentralized vision is some mechanism for setting ambitious higher-level targets and getting buy-in from each local and regional board to do its part. USDA's Food and Nutrition Service (FNS) has requested public comment on the question: Should store-level redemptions data for the Supplemental Nutrition Assistance Program (SNAP) be shared with the public? This blog has long encouraged making public such information, which is useful to low-income communities seeking to improve access to healthy food. In 2010, I covered the efforts of the MuckRock website to make public similar information. More recently, the Argus Leader pressed USDA to release store-level SNAP redemptions data. Tracie McMillan summarized the controversy in an article for the Food and Environment Reporting Network (FERN) and Mother Jones in April. The public comment period is open through today. Act now if you would like your voice heard. Here is an excerpt from my comment, submitted just now. Thank you for requesting public comment on the question: should USDA/FNS release store-level redemptions data for the Supplemental Nutrition Assistance Program (SNAP)? SNAP represents an increasingly large fraction of the U.S. food retail economy, now accounting for more than 10% of all food retail sales (Wilde, 2012). SNAP is the nation’s most important anti-hunger program, of course, and in recent years the program also has become a critical and central part of the food retail economy overall. To administer this responsibility transparently, in circumstances such as this one where information release is legal and ethical, USDA/FNS should make the information available. With growing public interest in encouraging access to sufficient healthy food retail in low-income communities, these communities require good information about store-level SNAP redemptions. In a newsmagazine article this year by Tracie McMillan, James Johnson Piett explained the need: “We’re working kind of blind when it comes to empirical data” (McMillan, 2014). The most important point is that SNAP redemptions data are not private confidential business information. Section 9(c) of 7 U.S.C. 2018(c) prevents USDA/FNS from sharing information that is “received from applicant and participating SNAP retailers.” Similarly, Exemption 4 of the Freedom of Information Act (FOIA) allows FNS to hold back “trade secrets and commercial or financial information obtained from a person and privileged or confidential.” In both cases the confidential information is obtained by the government from a private party or firm. In the comments to FNS that have already been posted to the Federal Register docket, many retailers have expressed concern over the release of their private business information. It is good for FNS to reassure them that private information they have provided will not be released. But -- despite the repetition in the submitted comments -- the basic store-level redemptions data are not private confidential information of this type. These redemptions data should be shared. In the comments from retailers on the Federal Register docket, retailers express concern about the feared difficulty and cost of new data collection mechanisms to provide these data. These fears are unfounded. If there were any new data collection cost or difficulty, FNS would be entirely correct to decline to collect or release these data. FOIA is about public release of existing data that FNS already collects. Certainly, the state SNAP agencies that administer the program already know the redemption amounts. What is this grain but blood and bones? Recently, the Real Food Real Talk site asked several other writers and myself to answer briefly, "What does food justice mean to you?" Much harder hitting than our answers, though, is this fierce reflection from the medieval poet Deschamps, written in the 14th century at a time when a popular working-class uprising had just been cruelly suppressed by the nobility. "Therefore the innocent must die of hunger with whom these great wolves daily fill their maw," wrote Deschamps. "This grain, this corn, what is it but the blood and bones of the poor folk who have plowed the land? Wherefore their spirit crieth on God for vengeance. Woe to the lords, the councillors and all who steer us thus, and woe to all who are of their party, for no man careth now but to fill his bags." From In a Distant Mirror, by Barbara Tuchman. The prevalence of household food insecurity in the United States remained above 14% in 2013, according to new data released today by USDA's Economic Research Service. An estimated 14.3 percent of American households were food insecure at least some time during the year in 2013, meaning they lacked access to enough food for an active, healthy life for all household members. The change from 14.5 percent in 2012 was not statistically significant.The prevalence of very low food security was essentially unchanged at 5.6 percent. Household food insecurity means that some household members at some times of the year experienced food-related hardships (the household respondent gave 3 or more "yes" answers to a set of 18 survey questions about experiences of hardship). The high rate of household food insecurity represents a major disappointment for U.S. anti-poverty policy. Rates of household food insecurity fell during the economic expansion of the 1990s, stagnated in the early 2000s, and rose dramatically during the financial crisis of the late 2000s. Despite hopes for renewed economic growth and reduced unemployment, these remain very difficult times for low-income Americans. In previous years, the United States solemnly adopted targets for reducing the prevalence of food insecurity from 12% (the level observed in the mid-1990s) to 6%. 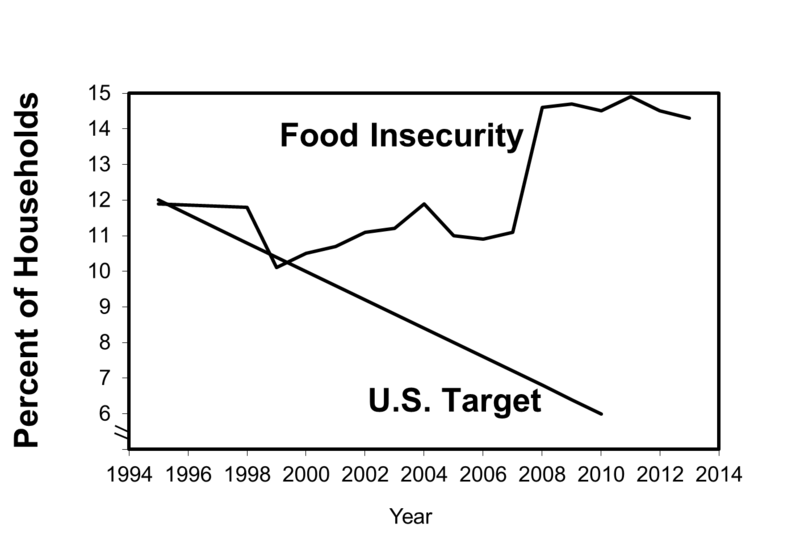 As my chart (based on USDA data) shows, this effort to improve U.S. food security has failed. Yet, neither Democrats nor Republicans talk much any more about any substantial realistic strategy for poverty reduction -- with serious objectives, quantitative targets, and implementation steps. Though food assistance is of course important, poverty reduction is the most promising approach to improving household food security in the United States.